Waterproof Mattress Protector Just $21.49! Down From $80! Check out this Waterproof Mattress Protector which is on sale at Amazon for just $21.49 down from $79.99 PLUS FREE shipping with Amazon Prime or for orders $25 or more! Even a tiny stain can void the warranty on your mattress! Zen Bamboo’s Bamboo Mattress Protector offers protection against damaging liquids, perspiration, and urine. Count on superior waterproof protection with this product! This premium mattress protector is fully hypoallergenic and protects against allergens, pet dander, and bacteria. Sleep easy knowing your mattress is protected from allergy causing dust and dust mites. It is perfect for people with asthma, allergies, and more! Using breathable material that allows for increased airflow, the ultra-cooling technology will keep you comfortable and cool throughout the night! Incredible quality at a more incredible price! 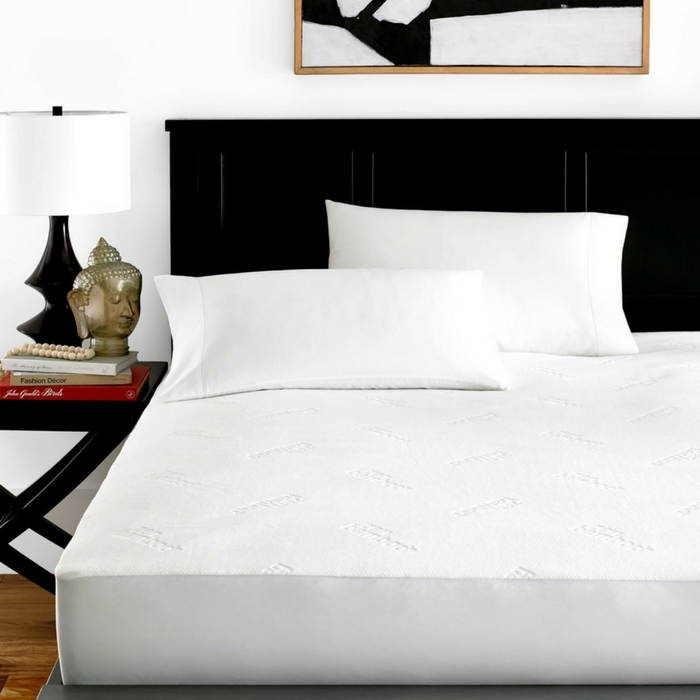 PROTECT YOUR MATTRESS’ WARRANTY – Even a tiny stain can void the warranty on your mattress! The Zen Bamboo’s Bamboo Mattress Protector offers protection against damaging liquids, perspiration, urine, and other staining liquids. With this mattress protector you can count on superior protection! HYPOALLERGENIC – Our premium mattress protector is fully hypoallergenic and protects against allergens, pet dander, and bacteria. Sleep easy knowing your mattress is protected from allergy causing dust and dust mites. It is perfect for people with asthma, allergies, and more! ULTRA-COOL BREATHABLE TECHNOLOGY – Using breathable material that allows for increased airflow, the ultra-cooling technology will keep you comfortable and cool throughout the night! A FIT YOU WILL LOVE – Zen Bamboo’s Bamboo Mattress Protector fits Full mattresses up to 54″ by 75″ by 15. Every cover is OEKO-TEX® Certified and free and clear of pvc, vinyl, and phthalates. Incredible quality at a more incredible price! Queen Size Waterproof Mattress Protector Just $26.95! Down From $70! PLUS FREE Shipping! Get your guest room ready this holiday season! Score this Queen Size Waterproof Mattress Protector at Amazon for just $26.95 down from $69.95 PLUS FREE shipping! SafeRest mattress protectors are well known for their premium protection against dust mites, fluids, urine, perspiration, allergens and bacteria. This has made them especially helpful for those with kids, pets, allergies, asthma or incontinence. With just one unprotected fluid accident, a mattress can be left with a permanent stain or odor. SafeRest premium mattress protectors safeguard your mattress against fluids and stains offering peace of mind and a more sterile sleeping environment for you and your family. Waterproof Fitted Jersey Mattress Protector Just $10.99! Here’s another awesome deal for you! At Amazon, you can score this Waterproof Fitted Jersey Mattress Protector for just $10.99 PLUS FREE shipping with Amazon Prime or for orders over $25! Protecting the top of your mattress from spills, stains and allergens does not have to be uncomfortable. This fitted sheet style mattress protector is made of lightweight jersey fabric for a soft, breathable sleep surface that does not alter the feel of your mattress. Beneath soft, cozy fabric is a 100 percent waterproof barrier that blocks out fluids, dust mites and allergens with quiet confidence. Liquid-proof membrane helps protect mattresses from stains, which could void the mattress warranty. Vinyl-free protector is safe for children. It has awesome reviews so it’s proven and tested!